Born in Cordoba, Veracruz. 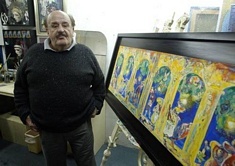 After Juan Soriano, he became the second artist to take on what is now called "La Ruptura" in Mexican art. His work is vibrant and calls for a change of views from the aesthetics of his time. He was joined in the movement by Jose Luis Cuevas, Francisco Corzas and Vicente Rojo.